Vigdis Salvius is an elderly farmer who lives in the farmhouse at Salvius Farm, located just outside the Markarth city walls. She is married to Rogatus Salvius, and they have one son: Leontius Salvius. 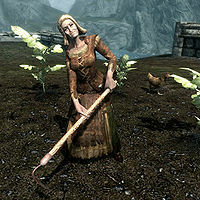 She is looking for help harvesting the farm's potatoes. She wears some farm clothes, a hat, and a pair of boots. She wields an iron dagger, and carries a key to the farmhouse and a selection of common loot and gold. She gets up at 8am and immediately heads out to work on the farm. After twelve hours of working on the farm, she heads back inside and relaxes in the house until her bedtime at midnight. When greeted, she'll welcome you, saying, "Oh, what is this? A visitor? To our farm? Oh, do stay for a while, dear." She'll also mention the demeanor of her husband, saying, "Now, you don't let Rogatus cause you any bother." and "My husband just gets cranky when he doesn't get enough sleep." She'll also tell a bit more about her family, saying, "Our son Leontius moved to Old Hroldan nearly 30 years ago. I still miss him. ", "I hope my son has found some nice, well-mannered girl to settle down with. ", and "Rogatus and I have been married over 50 years. He's always been a bit of a grouch." Vigdis: "How do you think the crops are coming, dear?" Rogatus: "Terrible. Only a matter of time before soldiers come and burn all my hard work into dust!" Rogatus: "Look at the sky. Be a terrible day tomorrow. I know it." Vidgis: "Oh, Rogatus! Maybe tomorrow will be pleasant for once, hmm? It can't be terrible every day!" Rogatus: "Yes it can. I haven't been wrong in 50 years, and I won't be wrong tomorrow." Vidgis: "Oh, wipe that frown off your face Rogatus. You've been wearing that frown for over 50 years now." Rogatus: "You want me to smile? What's there to smile about? Soldiers and dragons are going to be trampling all over the crops this year. I just know it." Vigdis: "Oh, stop being such a grouch! Not every visitor to the farm wants to burn it down! Maybe they just want to have a nice supper with us, hmm?" Rogatus: "You don't invite monsters into your home to have supper! I won't have them here, and I'm certainly not smiling for them!" Vigdis: "Maybe we could invite some of those nice guards over. You know, for some supper?" Rogatus: "No. I have enough trouble without more mouths to feed! They're the Jarl's men, they can eat supper at the keep." This page was last modified on 7 July 2015, at 16:20.